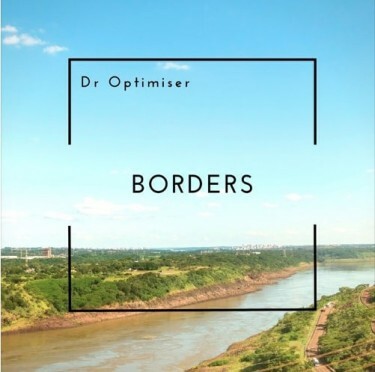 Borders is a new album from UK based composer and producer, Dr Optimiser. There’s quite a bit of variety on this 12 track release. The songs range from retro-futurist synthwave to house to electro-acoustic. The opening track The Theorist sounds like something about of early 90′s science fiction film, while Dementia reminds me of the music in SNES RPG classics like Secret of Evermore. The final track Memories serves as a lovely acoustic finale and is the least “electronic” sounding song on the album. Maybe it’s because the production is so pristine and the composositions are so meticulously precise, but I feel like Borders has the feel of a film/television soundtrack. One gets a sense they are not just listening to a record but are experiencing various stages and scenes in some kind of tale or overarching narrative. The songs are aesthetically cohesive while retaining their individual uniqueness. Atmospheric clues are often provided in the brief titles, many of which are associated with border disputes (Crimea, Damascus, County Lines, etc.) Don’t expect overt political commentary or banter on any of these hot button issues though. The album is strictly ambient and abstract in its approach. Borders is an excellent conceptual album and will provide the listener with a lot to meditate on.